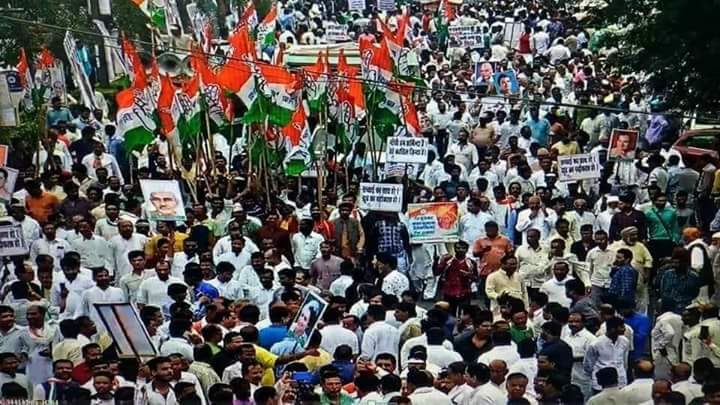 The overwhelming and ocean-like support former Madhya Pradesh Chief Minister Digvijay Singh got on Thursday (26 July 2018) when he went in procession to court arrest at a police station in the State capital, as State Chief Minister Shivraj Singh Chouhan had earlier called him a “traitor”, has proved beyond doubt that even 15 years after the senior Congress leader handed over the reins of power in Madhya Pradesh, he still continues to remain one of the tallest among all Congress leaders from the State. The Police refused to act against Diggy Raja (that’s how people call the scion of the erstwhile princely State of Raghogarh out of affection) saying no complaint has been lodged against him. Diggy has not only registered protest against the sitting chief minister but also pinned him down politically with general elections to the State Assembly only a few months away. The Chief Minister would now be hauled up in court, Diggy has announced. The courtroom battle notwithstanding, all eyes are now on the battle of the ballot. Diggy will be one of the main players leading the Opposition Congress onslaught against the ruling Bharatiya Janata Party that is desperately trying to swim against the anti-incumbency wave threatening the Shivraj Singh Chouhan led State Government. Chouhan is trying to create a record of sorts by leading his party to victory for the fourth time in a row but the odds are heavily against him and the ruling party due to massive unrest among farmers, rampant joblessness, poor condition of those in the unorganised sector, deplorable law and order situation, mob-lynching incidents in different parts of the country, malnutrition, child mortality, extreme poverty and the economic downturn (contrary to GDP growth rate and other figures being churned out regularly by the Modi government to project all is hunky-dory economy-wise in the country) in the post demonetisation phase. Rising corruption in Madhya Pradesh is another issue that people have started taking too seriously. VYAPAM or the medical admission and recruitment scam has broken people’s faith in governance and the State BJP Government. In this scenario, the Congress has lined up its troops and the party leaders are not leaving any stone unturned to take the BJP head-on in the coming election. It is an entirely a different matter that the BJP-wallas are going gaga over the crowds that are coming to greet the Chief Minister, who is now on his “Jan Ashirwad Yatra”. The knowledgeable and those in the State administration at the district level are testifying how these crowds are being managed by requisitioning school buses in small towns and as a result schools are being shut down to please the executive head of the State who is on a mission to garner votes even at the cost of students’ education. Diggy, fresh from his marathon Narmada Parikrama, is in his new formidable avatar – as always, he remains gentle, amenable, easily accessible by one and all. The battle lines have been drawn in Madhya Pradesh. Those who cannot see beyond the interests of the ruling side are talking of factions within the Congress. They forget that Congress in Madhya Pradesh is not a fragmented house. It has always remained a political landscape with leaders acting as warlords with their own areas of influence. This has always remained the case. One is reminded, prior to the 1993 Assembly election, after one year of President’s Rule that followed the demolition of the Ayodhya structure, the Madhya Pradesh Congress unit looked like a divided house and there were apprehensions in Congress circles that lack of party unity might shatter their electoral prospects. At that time late Madhavrao Scindia was the architect of the now-famous Dabra spirit. It was at that juncture that Scindia had organised a convention at Dabra, near Gwalior, and brought on one platform the party leaders heading different factions and there was a grand show of unity that eventually helped in bringing the Congress to power in Madhya Pradesh in December 1993. This time, all Congress leaders, rank and file in Madhya Pradesh, are wary of the fact that if they remain pitted against themselves they would lose all and this is motivating them to close ranks and as State Coordinator of the Congress party, Diggy is a major cementing force. Adding punch to his efforts are front-ranking leaders – State Congress President Kamal Nath, Campaign Committee chairman Jyotiraditya Scindia, Leader of Opposition in the State Assembly Ajay Singh, former Union Minister Suresh Pachouri and former State Congress President Arun Yadav.